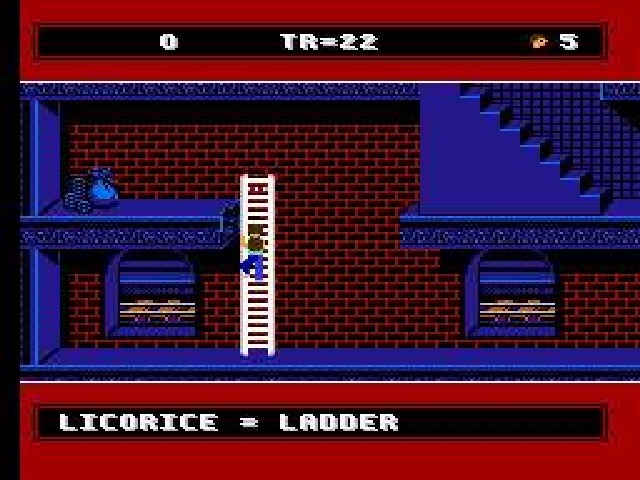 Much like there’s always room for Jell-O, there’s always room for gelatin-based videogame sidekicks, especially those that combine the exploration and problem-solving spirit of a point and click adventure game with the run-and-jump action of a side-scroller. 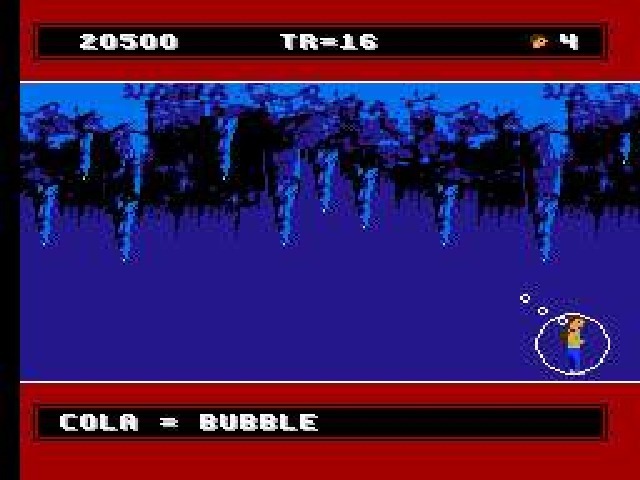 “A Boy and His Blob”, brought to you by David Crane of Pitfall fame, does just that. He's like Frosty the Snowman, but with more ectoplasm. It breaks down like this: In the far distant future world of the twenty-first century, plenty of kids have friends from other galaxies. Your character (the titular “boy”) happens to be pals with Blobert, a blob from the planet Blobolonia. It’s a great planet, low rent, good schools, nice and cool by the lake, but like countless other videogame planets, it’s fallen prey to the tyranny of an evil emperor. This particular despot force-feeds his blobby subjects chocolates and other sweets, because to him and his evil ilk, healthy foods are poisonous. It’s never really clear if there’s a moral there, but we’ll touch on the food thing again in a moment. Your mission is apparent: Rush to Earth’s nearest Subway station and tunnel down to a labyrinth of underground caverns where you’ll search for buried treasure in order to gain enough wealth to buy a large supply of vitamins which you’ll take with you to Blobolonia where you’ll battle the evil Emperor’s army to free your best friend’s homeworld from cruelty and oppression. Piece of cake. You’ll be back in time for M*A*S*H.
Actually it’s a littler tougher than it sounds, but you’re fairly well armed. Ya see, your glutinous companion can morph into a number of helpful objects such as a trampoline, a ladder, a jack, a bowling ball, a bubble, a hummingbird, a hole, a rocket, a blowtorch, and a “Vita Blaster” for dispatching your enemies. Think Kirby with a bit more challenge. You can control Blob’s transformations through the different types of jellybeans you feed him. Experimenting with this and judging which form is appropriate for the obstacle at hand make up the bulk of the gameplay for the first half of the game on Earth. When you’ve amassed enough treasure to buy a sufficient supply of vitamins, and have found the elusive jellybean flavor that will change your sidekick into the Vita Blaster, it’s time for the second half of the game on Blobolonia. Here, you make your way past various enemies with different attack patterns until you reach the Emperor for the final showdown. Hey, when I said “titular” in the second paragraph, you giggled like a drunk nun didn’t you? Go on, admit it. They're just friends, but they enjoy a good climb now and then. This game has been criticized as the first of the games you absolutely need a strategy guide to complete. Patently untrue. Anyone who tells you this, is either lazy, or just wasn’t up for this type of game. “A Boy and His Blob” is centered around exploration, like any good adventure game. Any confusing elements, and there are admittedly more than a few, can be clarified with a simple glance at the very well laid out manual. Control is simple. Whistle at the blob to get him to come. Feed him a jellybean to get him to do something. That’s literally all you’ll ever need to do in the game. The challenge arises from determining what trick should be used when to reach your goal and fully explore the caves. I do concede, though, that some of the transformations can be baffling at first. I got very frustrated when I used the blob as a trampoline to reach a high cliff, only to discover that by doing so I had stranded him below. But with a little experimentation, I soon discovered that another of his shapes (which I manifested by tossing a different jellybean several screens down to my loyal comrade) was designed expressly for the purpose of solving this problem. It’s part of the challenge, folks. On the flipside, the latter half of the game provides action enthusiasts with their poison of choice as well. This mix never feels forced, though one can tell this is an intellectual game at heart. One hit will kill you, but little forced mini-game-like areas give you several chances to earn extra lives. And as a nice twist, the final fight is won through puzzle-solving rather than violence. I don't want to know how he's breathing in there. It’s honestly quite entertaining and anyone who tells you different is a dirty carpetbagger, plain and simple. Puzzles are fun and challenging without being impossible. Environments are flexible (you can use Blob to go directly through floors or ascend to higher levels at any time). And the whole thing’s got a whimsical sci-fi thing going for it that I just can’t resist. In general, it seems like a lot of care was taken to make this an enjoyable, unified experience. I guess the credit goes to David Crane whose name (and connection to Pitfall) is plastered throughout. Crane doesn’t leave you hanging down in the subterranean depths of the city. He keeps the exploration open-ended, while keeping the goal clear by giving you a counter that tells you how many treasures you still have to find. That’s courtesy. 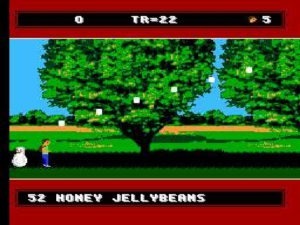 Additionally, he avoids a common annoyance found in games that force you to cycle through lists by providing a way to scroll backwards as well as forwards through your jellybean supply. So, accidentally going past the flavor you wanted won’t mean a return trip through your entire inventory. Thanks again, Dave. The action controls are pretty straightforward. As I said above, whistling and candy-tossin’ are really the only two skills you’ll need to master. Aiming the Vita Blaster gets a little dicey, but at least you CAN aim it, rather than only being able to shoot forward. Movement, however, is a little tiresome. 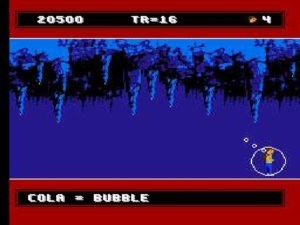 The game tries to emulate the Hanna-Barbara style of running, meaning you often skid to a slippery stop several feet beyond your intended target. Blob’s movement is imprecise as well. If you whistle for him, he’ll usually get right next you, but otherwise he follows a few paces behind, sometimes forgetting to follow altogether. This gets especially annoying if you have to position him at exactly the right spot to pull something off. You will get used to compensating for this, though, and the manual is at least honest about it. It gives you the invaluable advice of turning Blob into a blowtorch so he can then be picked up and placed precisely where you want him. "If all the raindrops were lemon drops and gumdrops, oh what a rain it would--AAAAH!!! DEAR GOD, THEY'RE MELTING MY FACE!!" A game about a mutating glob o’ goo better have decent graphics, and decent graphics it does…have… To be blunt, each of Blob’s forms look like what they’re supposed to look like, while still looking like Blob. Not too hard to do, just slap a pair of eyes on a rocket and call it a day, but an important aspect of the visual style. The dull brown of the caves is broken up by the blues in the lower water levels. The industrial grays of the Emperor’s palace contrasts with the jungle area surrounding it. And the animations are quite cartoony. For example, if you walk off a ledge, you’ll take a few steps into the air, look down, look at the screen, wait a beat, and then finally plummet to your doom. Sound-wise, there’s not a great deal to report. The music never gets old, nor intrudes on the experience, and the sound effects are appropriate, if remedial. I’m probably the biggest booster of this game you’ll find. The best reviews on the net seem to consider this an ambitious, but flawed concept at best. I disagree. It’s not too hard, because I beat it in almost one sitting and I’m a moron (ask the J Man). It’s not too boring, because I can’t sit through ten minutes of any Final Fantasy, and yet I handled this just fine. It’s just a specific type of game offering a specific type of experience. If you want another Contra, look elsewhere, but if you’re up for some puzzle-solving and treasure hunting presented in an original way, then “A Boy and His Blob” is most definitely worth a shot. A cartoony, interplanetary adventure with plenty of light puzzle-solving and creativity. Multiple opportunities to be inconvenient and annoying are wisely passed up. Imprecise movement puts a cramp in your style and might frustrate gamers with A.D.D. (All of them.) The manual’s required reading, so if you’re illiterate, forget it. Then again, if you’re illiterate, your mom’s a whore and you smell like feet.